Figure out how much buying a home in your estimated price range will really cost you monthly, including all the expenses I pointed out above. Subtract your current monthly rent from the total figure you came up with in Step 1. For example, if your current rent is $1000 and your monthly homeownership cost is $1,450, that is a difference of $450 per month. Set up a new bank account. On the first day of each month - not the second, not the third, but the first day of each month - you are to deposit whatever the difference is between your current rent and what your projected homeownership costs would be; in our example, you would deposit $450 into the account. You are to do this every month for six months. If you are late in your payments, or if you feel stressed out trying to make the payments, you should take this as a sign that you may not be financially ready to become a homeowner. Then take a little of this money and go out and celebrate. You deserve congratulations for going through this process and learning you aren't yet ready to buy. You just avoided making a huge financial mistake; and in my book avoiding mistakes is an important part of life. If, on the other hand, it was easy for you to make the extra $450 monthly payment, that's a financial sign you can probably afford to buy the house you want. That's the good news. The great news is you now have an extra $2,700 you saved during this six-month test that will come in handy to help pay for your closing costs on the mortgage, or the new furniture I know you are going to want, or - better yet - to increase the size of the down payment. Come on, you didn't actually think we could get through a column without talking about your FICO score, did you? Before you even think about looking at homes, I want you to make sure your credit report is spanking clean and your FICO score is as high as possible. Remember, the higher your score, the lower the interest rate you will be offered on the loan. If you get your score to 720 or better, you're in the "top group" and will be in line for a great rate of 6 percent or so on a 30-year fixed rate loan. But if your score is 100 points lower, your rate is going to be closer to 7.8 percent. On a $150,000 mortgage that translates into an extra $180 or so you're going to need to fork over each month. And over the life of that 30-year loan you're looking at paying tens of thousands of dollars more in total interest costs. It clearly pays to get your credit score in order. So while you are debating whether you should keep renting or take the plunge and buy, why not use that time to make sure your FICO score is the highest it can be? Okay, so let's say you make it through all my tests and steps, and you feel you are ready to buy a home. Good for you. But there's one more hurdle we need to factor in. Furniture. Trust me, you are going to want new furniture, and we know how expensive that can be. If you think the furniture you have in your rental is going to make you happy in your own home, you are doing some interesting drugs. I can guarantee you that all the old hand-me-down furniture that worked great in your rental isn't going to psychologically cut it in your new digs. Sure for awhile it may suffice, but over time all those well-placed ads will get the better of you, and you're going to want to go on a furniture-buying binge. And I bet you'll be tempted by those "interest-free for one year" furniture ads. This is as dangerous as a zero down mortgage. You charge and charge until your home is full of new furniture to impress your friends. And in the process you pile up a ton of credit card or consumer loan debt. Congratulations, you have just put yourself in a serious "small" debt bind at the same time you have committed to the biggest financial responsibility of your life: the mortgage. No wonder we have a record level of foreclosures. So let's imagine what sort of damage all this spending is going to do to your cash flow. And don't get me started on all the other hidden costs, such as your need to get the latest and greatest barbeque, snow blower, or lawn mower. Let alone new silverware, new linens, etc. to put on your new table. And the new-house beat goes on and on and on 'til your financial heart can't take much more. Now don't get annoyed at me because I sound negative. That's not what I'm aiming for at all. I want you to own a house, but I want you to make the move only after you fully understand the true costs of what it takes to become a homeowner versus staying a renter. So before you go out and buy a household worth of furniture you may not be able to afford, here is my advice: just date your house for awhile before you get married to it. This means that while you are getting to know your new home, just live in it with what you currently have. See what rooms you like the best. Observe where the sun hits. Think through what kind of furniture you would like and then just do it one room at a time, so you can pay the bill without running up a balance on your credit card. Trust me, it's better to not have a new designer chair to sit in, than no money to live on. That said, if you have a ton of furniture in your rental that you know you don't want in your new home, don't bother with the expense of moving it. It's okay to live in a sparse home for a few months. And it's smarter to sell or donate the furniture (for a tax break) than to pay for it to be moved to the new home, where eventually you'll have to pay for it to be removed a second time. 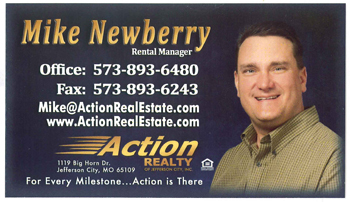 For more information about our available properties to rent, call Mike Newberry today!